Imagine you're a game developer, working on an independent project for two years. You spend $10,000 of your own savings on assets, artists and sound designers, and finally you release the game for $0.99, expecting to break even, maybe, in a few years. Three months after launch, you get a letter from a lawyer yelling at you in all capital letters, alleging you've violated federal statutes and if you don't take your game down immediately, you'll be sued for everything you're worth, and your friends and family are going down with you. This is the cautionary tale that Shaun Spalding, the Assistant Director of New Media Rights, tells us as an introduction to what his group can do for independent developers at all levels. In this situation, "You'd freak out, right?" Spalding says. "The problem is, a lot of times these letters are completely bogus, or overreaching and deceptive." New Media Rights helps independent developers, filmmakers and startups sort through the BS, and offers professional legal assistance on a range of issues that they face every day. These are services that usually cost $300 to $500 an hour – and New Media Rights does it all for free. New Media Rights was founded in 2007 by executive director Art Neill (pictured above), and consists of himself, Spalding and a team of volunteer clerks from California law schools. They handle all the inquiries, fight internet regulations harmful to users and now have a YouTube series dedicated to providing concise, general information on a range of legal issues within game development. It's called LAGD, "Legal Assistance for Game Developers," and season one has more than 120 episodes, including interviews with Gabe Newell, Edmund McMillen, Chris Avellone, Zach Barth and Rami Ismail. LAGD season one also covers general topics such as copyright FAQs, independent contractors, non-disclosure agreements, and trademarks and branding. "The internet has created a world where one person with enough talent, like Tarn Adams of Dwarf Fortress or Phil Fish of Fez, can create games that people like way more than competing products from large media companies like EA," Spaldings says. "The big issue is that these large media companies also have well-paid legal departments to help them comply with all the complex laws that are out there. Indie developers, especially hobbyists, really only have Google to rely on. "So that's why New Media Rights is here. After you run out of information to Google, we can take your issue and do the more technical, skilled legal research. Or if you need some sort of document drafted or looked over, we can do that, too. Or If someone is using lawyers and money to tell you to shut up because they don't like your opinion, we're here to rough them up and give them the old once-over for you." The most common questions that New Media Rights handles deal with cloning, whether it's a developer who wants to release a clone or one who's angry that her game has been cloned. "It's extremely complicated to figure out what is a legal homage to a game and an 'illegal' clone," Spalding says. "That's why companies like Zynga can do ethically dubious things like take indie developer ideas wholesale without much those developers can do." The best advice that Spalding has in these situations is to talk to a lawyer or a nonprofit with expertise in the field. This issue isn't cut-and-dry, and it's so prevalent that in December, New Media Rights will launch a 10 - 20 page guide just about cloned games. New Media Rights has helped dozens of PC and mobile developers, Spalding says, but he can't disclose many specifics because, as a lawyer, he's under confidentiality obligations. He is allowed to mention how New Media Rights helped developers launch a standalone version of The Dark Mod, a Doom 3 total conversion, and how his team fought and won against a large company that improperly threatened the mobile game Wordsmith. "Sometimes working for New Media Rights is like working with the CIA," Spalding says. "Have you ever seen Homeland? No wonder the main character is crazy; she can't tell anyone anything." 1. Don't name your game the same name or something confusingly similar to another game (especially if you're trying to copy that game). You'd be surprised, but that's the No. 1 thing that people get in trouble for. If you want to make a game similar to "Pokemon," don't call it "Poketmonster," don't call it "Pokeman," and especially don't call it "New Pokemon Adventures." It seems like common sense, but almost 50 percent of projects that come to us, there's at least a potential trademark problem. That's why we devoted a whole 15 minute lecture episode to trademarks. 2. Figure out who owns what ahead of time and make sure that everyone you're working with understands the goals of the project. So many problems with indie projects happen just because the small group of people you're working with aren't all on the same page. No one knows who the group leader is, or someone thinks they individually own their own contribution rather than the group owning it as a whole. Someone wants to work on an open-source or freeware project, and then it changes commercial halfway through. One person think she's doing the most work and should get the biggest cut, but doesn't tell anyone else about this until it's time to divvy up the money the game made. The LAGD YouTube series hits all of the aforementioned topics and wants to cover even more in season two – if it can get funding. New Media Rights has relied on individual donations since 2007, but has now turned to Indiegogo, asking for $16,000 by December 21 to help fund LAGD and its free legal services. "We work 10 - 12 hour workdays," Spalding says. "There have been months where I've worked every day including weekends for 30 - 40 days at a time. This is because we know that we only have one shot at the end of the year to get people to see all the great work we've done and want to support us during our fundraiser. And I think we did a good job this year." This year, New Media Rights helped more than 400 projects, including high-profile cases such as Anita Sarkeesian, and produced more than 14 hours of free, openly licensed educational video. It is also heavily involved in FCC and Copyright Office politics, and in 2012 New Media Rights was one of the groups that fought for and won the right of consumers to jailbreak their phones. Founder Art Neill is part of the FCC Consumer Advisory committee and Spalding is an alternate, and throughout the years they've led efforts to review the (now-failed) AT&T – T-Mobile merger, supported net neutrality and cosigned a letter with the Mozilla Foundation and the EFF urging Congress to not make another bill like SOPA. New Media Rights has had its hands full, though unlike many legal firms, it's not been with fistfuls of cash. "Our goal with our educational work like LAGD is to make sure that the people we help don't need lawyers," Spalding says. "Most attorneys work the opposite way: They want you to stick around so they can keep billing you for their information. Since we don't have a profit motivation, our goal is for everyone to be able to figure out how to help themselves, so we only have to intervene when the situation gets so complicated it requires our technical expertise." 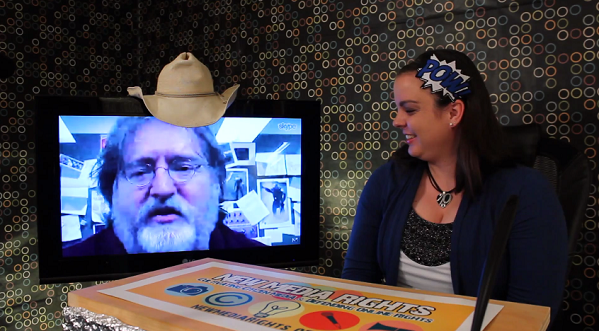 One perk of working at New Media Rights is probably a fantasy of many PC gamers and was a highlight of LAGD season one – an hour to pick Gabe Newell's brain. "Even though Lauren, the host of the LAGD videos, researched and prepared her questions for a few days before the interview, right after Gabe hung up she said, '70 percent of the things he said were so far above my head it's crazy. I just tried to smile and nod and pretend that I knew what he was saying. Gabe is a genius,'" Spalding recalls. "He really is. He brought such a unique, forward-thinking perspective that was different than where many of the other interviewees were coming from." As a non-profit legal outfit, New Media Rights can relate to that final description as well.